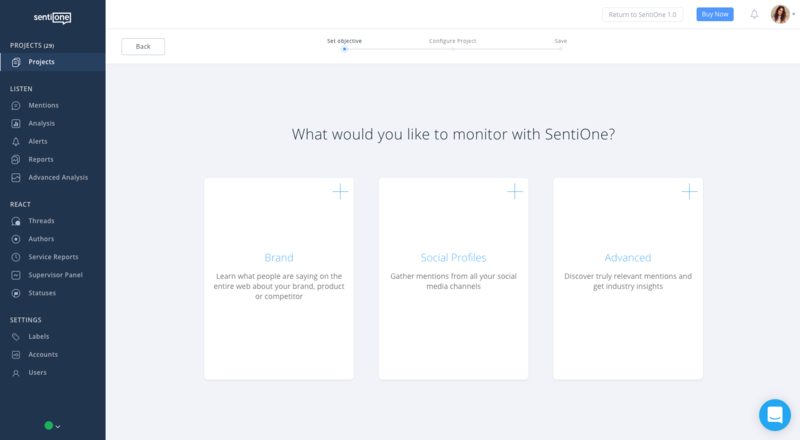 Projects, to put it simply, are your keywords and search rules that SentiOne uses to collect mentions about what you look for from multiple online sources. Brand - this is the easiest way to verify what people are saying about your brand, product, or competitors online. Social Profiles - if you add your social profiles (e.g. Facebook, Instagram, Twitter), you can have all your social mentions in one place. Two types of search within the Advanced Project Configurator where you can use many advanced rules. To create a new project, go to Projects screen and click the +CREATE button. You will be redirected to the Project Configurator. First, write down keywords - include the ones you want to look for and exclude what you are not interested in (but might have got caught up in your search and cloud your results). ‘Exclude author’ hides all mentions from a particular author. 'Exclude URL' hides single mention. ‘Exclude domain’ hides all mentions from a particular domain. All ignored items can be viewed and restored under the ‘Excluded’ button on the upper right side. 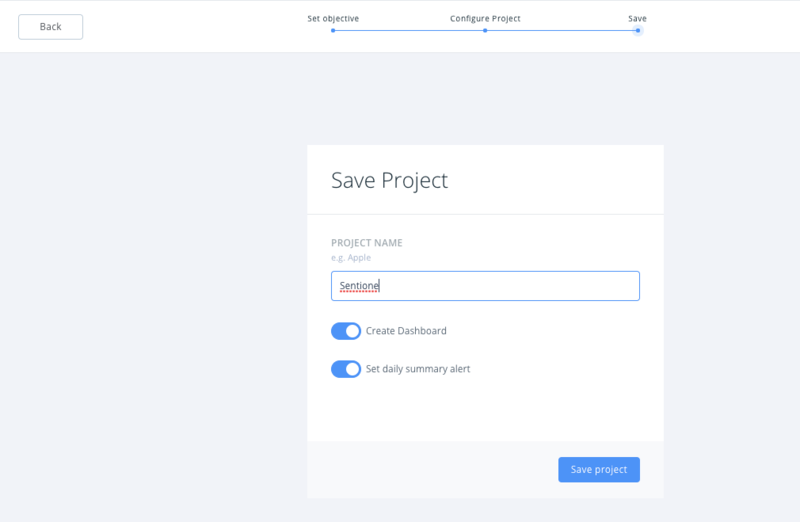 Don’t forget to name and save your Project! We recommend you to create an Analysis so that you can get all the data analysis in a visual form of customisable charts. At this point, you can also decide if you want to receive daily email alerts for this project. Add your social profiles (e.g. 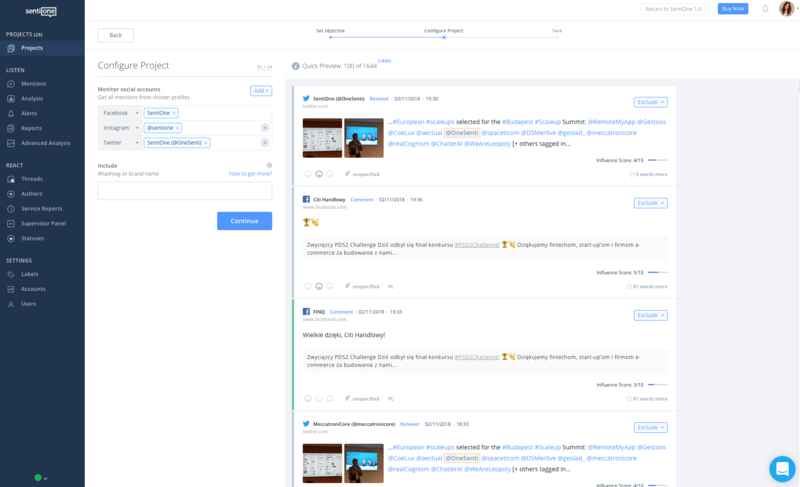 Facebook, Instagram, Twitter, Youtube) to have all your social mentions in one place. We also recommend you to authorise your social profiles in Accounts tab to monitor activity on your channel faster and get private messages from that channel if requested. If you want to expand your search, type in additional keywords - include the ones you want to look for. If you add your social profile, please note that within this configuration you are tracking your own posts AND all others related to them: mentions, retweets, shares, comments, and private messages (if the account was authorised successfully). The advanced project set-up should begin with naming the project. The name should define monitored issue in a concise way – as brief as possible (despite the lack of character limit) and easily recognisable for team members. Step 2. Add Facebook (optional). Step 3. Add Sources (optional). Step 4: Set up additional Options. 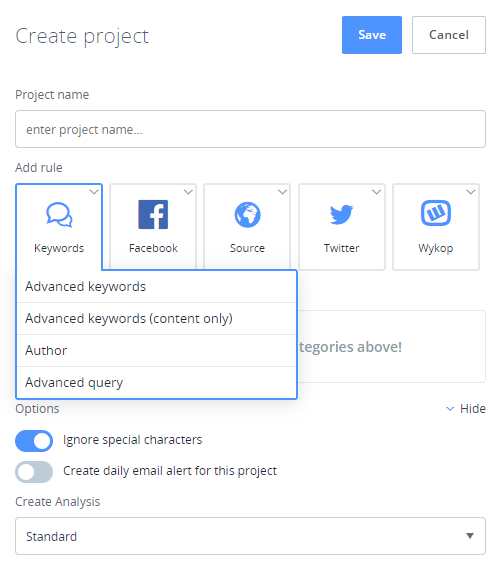 When you enter the Advanced Project Configurator, there are two windows open by default where you can type in keywords (these are advanced keywords which apply to the content and the context of mentions). However, if you want to use other rules, close both windows, then click Keywords and select an appropriate rule. Type keywords you want to include in your search. If you see unwanted content in the results preview, you can exclude keywords for more relevant results. One keyword is enough for the system to display the results immediately. 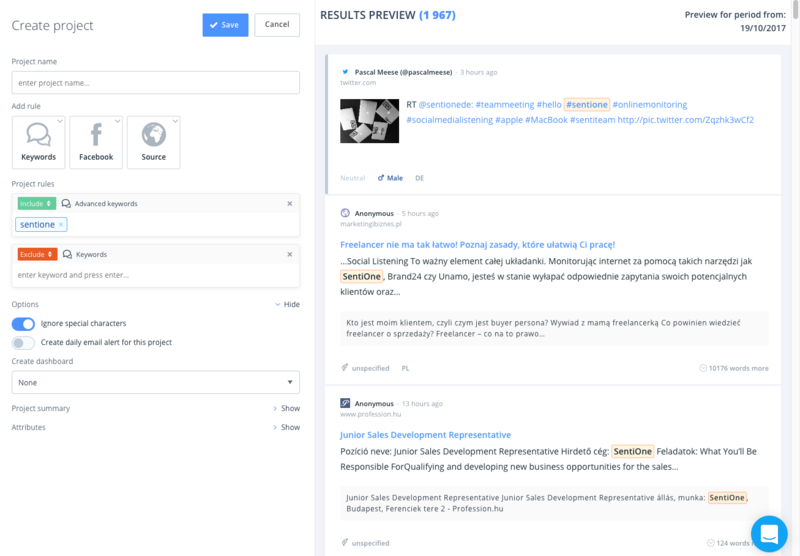 Adding Facebook fanpage leads to obtaining all public mentions (apart from statements containing keywords from all sources) published by both the administrator and users of a given fanpage. If you would like to retrieve all the mentions from a certain fanpage, choose the ‘Fanpage’ rule. Then, in the field that will be added to the creator, start typing its name. 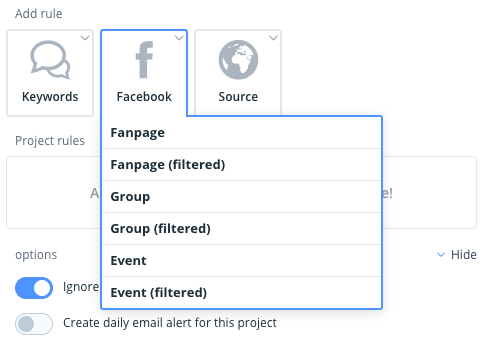 SentiOne will auto-suggest the fanpages, as you type. If you wish to retrieve only specific mentions from the fanpage, containing keywords you specified earlier, choose the ‘Fanpage (filtered)’ rule type. NOTE! You need to set the keyword rule before the ‘Fanpage (filtered)’ rule to get the proper results. Domains to monitor (or exclude from the results) mentions from specific forum or website. This rule allows to narrow down the mentions to a particular domain. The domain rule does not require defining keywords to work properly – by choosing only a domain, you will obtain all mentions from a particular source regardless of their content. URLs to monitor mentions from the specific Instagram or Twitter account, even from a single thread on a chosen forum. The rule works similar to the Domain rule, narrowing the mentions down to a particular link (like a thread on a forum). Language to narrow the results down to only one language. Additional options allow ignoring special characters in keywords (like diacritical marks), set email alerts to a given project, and also to create a new Analysis. Following the rules in the example will create a project that monitors SentiOne keyword, all posts on SentiOne fanpage and exclude all mentions published on the pointed source. In SentiOne, you can use rules based on Facebook sources and any other type of sources. Special characters which introduce new search possibilities: * / ? keyword: engine*, results: engine, engines, engineer, engineering, etc. Typing in the keyword box two or more words with spaces between them (without quotation marks) will result in obtaining statements including these words in that specific order. For example, entering a phrase social media (and clicking ENTER afterwards) works exactly as “social media” (with quotation marks) and will trigger the system to search for the 'social media' expression and not these words used separately. If you click ENTER between words social and media, the system adds “OR” rule, as in looks for the words as separate keywords. While creating your project, you can see the preview of results updated with every change in the query in real time, on the right side of the screen. Use this feature to adjust your queries and make sure that you get truly relevant results in your analysis and reports. In SentiOne, we have 2 types of rules: keyword- and source-based rules. 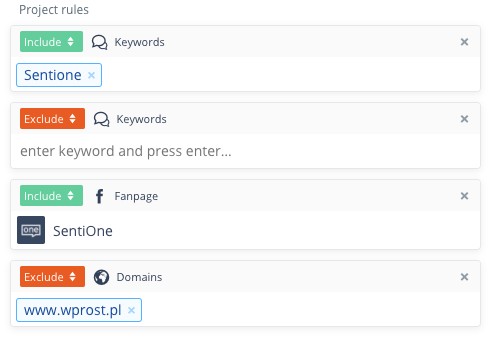 To set a project based on keywords, hover over Keywords. Advanced keywords – will open another field where you can enter queries with logic syntax retrieving whole discussions containing your advanced keywords. 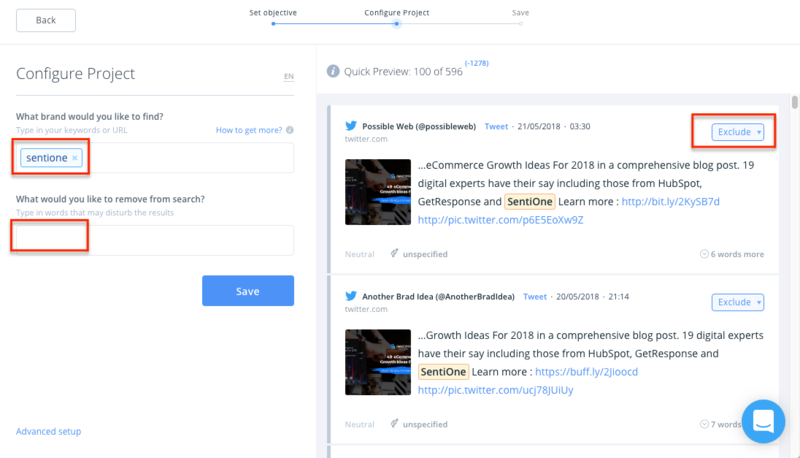 Advanced keywords (content only) - will open another box where you can enter queries with logic syntax retrieving just the mentions containing your advanced keywords. Advanced query – will open another box where you can enter a query with advanced logic syntax.